Shoot while skating and follow the shot. Hit the net. You only need a goalie on the pass off the pads but could put a board or pad to create rebounds. Line up outside the blue line just inside the dots. Square up to shoot one timers. For the pass off the pads the goalie plays without a stick. 1. Circle the line and shoot from both the middle and wide lanes, switch lanes and return on the outside. 2. Cross and drop (leave) behind the lineup then pass for a one timer if the shooter is on the backhand and a one touch if going to the net on the forehand. 3. Cross and drop and the shooter pass off the pads shooting low at the far side. * Push ups if they miss the net. This is not the most complicated drill in the world but it is very effective for practicing shooting while moving. I have my players take slap shots from the top of the circle as a lead up to one timers. If you can't take a slap shot then you can't one time the puck. They can also practice the wrist or snap shot while skating hard. I usually do this when my goalies are working at the other end with a coach. Both lines can leave and players should keep switching lines and shoot from both the middle and wide lane. Teach them to leave puck on the cross and drop and then make a firm pass for a one timer and a hard pass for the forehand one touch shot. They also have fire the puck hard to the far side for the pass off the pads. This simple drill has been very effective for increasing my teams scoring. I need to edit them and make diagrams. Eye contact, hands away from the body, roll the puck heel to middle, use eye and stick fakes, give a target, keep the stick square to the puck, absorb the pass, keep the shoulders loose, use both the forehand and backhand. Go in all directions when in the neutral zone. Add skills like two touches only, backhands, escape move when you get the puck. Other tasks like 2-1 keepaway, fake pass to one and pass to two, one touch etc. are possible. Also add full speed for 5’ on the whistle. 1. Skate around the ice with a partner and pass. 2. Goalies warm up with a coach at one end. 3. Move into the neutral zone and continue passing weaving through teammates. 4. Get into groups of three and continue passing between the blue lines. Skate to get open. Give a target and absorb the pass. Skate to open ice with 3-5 hard strides when you get the puck. Fake passes and escape move create time and space to make plays. Make only forehand passes. Add other passing or skating rules to work on skill and good habits. 1. Players line up in two groups behind the blue line. 2. Three players from each team race for the puck the coach passes in. 3. Fourth player is a Joker. 4. To go onto offense you must pass to the Joker. 5. Five passes equals one point. 7. Pass to your team when the whistle blows for the next 3. * Option is to play 3 on 3 keepaway in each zone. players have made a pass. 1. Two then three then four then five players leave. 2. Each player must make a pass in each zone. 3. Take a shot at each end. 4. Skate facing the puck and make forehand passes. 5. Possible sequence is reverse and 5-4-3-2 leave the other way. Start with one player who touches both knees at each blue line. If less than 20 skaters i.e. 16 go 1-2-3-4 then start the other way and go 4-3-2-1. Another option is to use one touch passes only, or do an escape move and then pass. 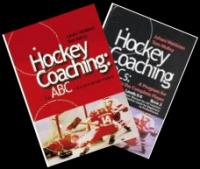 This is a huge resource of over 1700 pdf.s of practice ideas from around the hockey world. You can use the search function to find topics such as 'Power Play' or group that is demonstrating such as, 'Pro', Czech U20, or just U20 brings up Czech, Russian, Finland, etc., There isn't much USA material but I coached with an American coach in Austria and he ran a lot of the RB Pro drills. I started writing up and posting these drills after I got back from coaching for the Salzburg Red Bulls in the 08-09 season. They called me in August and had identified me as one of four skills coaches from North America. I was on the top of the list and the job was mine if I wanted it. My wife said for me to go because I had turned down things earlier because neither her or my kid's wanted to leave. She said you have always wanted to do this but she was still working as a nurse and we had 6 grandchildren she didn't want to leave, so she stayed. It wasn't working out that well with us both being alone so I told the Red Bulls with a month left that I couldn't come back the next season. I was coaching with elite coaches from Sweden, USA, Russia, Finland, Slovakia, Czech Republic and I thought it would be smart to take videos of them on ice so I didn't forget what they do. I did a lot of video watching practices. I had the option to go on ice for all the practices but only went when I was running some drills and the others I took video. I have a lot of trouble understanding diagrams of drills; especially when they have multiple stages to them. That is why a video is included. I take the video and then write them up, code them in our ABC method and do a diagram based on the clip. I didn't add the group like Pro or U17 until about 2011, so those pdf.s before that don't have who is doing the drill in the title. I was doing these for myself and then Dwight set up this site for me to make it easy to share. So hopefully it helps some of the coaches. I know I would have loved to have a resource like this and I use the material all the time. I live in Calgary and Hockey Canada has it's offices at Winsport which has four arenas and many international teams come and practice here. NHL teams also practice there, so I take video of what they do so I keep up to date with the game and share them here as well. There are also many articles and drill booklets, ten best lists, Youtube links, etc. that I have prepared over the years. The coding explanation makes it easy to find what you want. i.e. If you are looking for a passing drill it would be coded B, a passing drill starting from the corner B6, from the four blue lines B600 etc..
A link to the same practice games and drills organized in A-B-C-D-DT-E-F-G-O-T - T1-2-3-4 Folders. A link to all the video, diagrams and PDF's. Maybe the largest data base of practice ideas in the hockey world. Then maybe not. To back up my Pro drills I put them on my One Drive. 1. Black A-B attack vs. Red A-B. 2. Black C-D follow when the puck crosses the blue line and support at the point. 3. Red C-D follow from the other side and cover the point. 4. Play 4-4 in the zone. 5. On a goal, frozen puck or change of possession Red C-D attack vs. Black C-D.
6. Red E-F support the attack at the point and Black E-F cover the point. * This sequence can be done 1-1 to 2-2, 2-1 to 3-3, 3-2 to 5-5 or random combinations that create odd man advantages in the attacking or defending end. * Teach players to read the game situation by sending out 1-2 or 3 new attackers or defenders. This causes players to communicate and adjust how they defend or attack. It may be a power play or penalty kill; players have to read it and act. Dump the puck in to work on the forecheck or quick breakout. Use your imagination as a coach to develop players with ‘Game Sense’. Goalies must be able to handle the puck and pass. Start with just the keepaway and then keep score to increase the compete level. I consider this keepaway game and this breakout sequence below to be the best way I have seen 'Yet' for goalies to improve their puck handling and passing. 1. Reds on one blueline and black on the other. 2. Goalies across ice from each other at the red line. 3. Play 2-2 and 3-3 keepaway where you must regroup with either goalie. 4. Goalies pass to the team that passed to them. 5. Start with 2 vs. 2. 6. Progression is 2-2 then 3-3 and you don’t check the goalies. 7. Progress to checking the goalies is allowed. 8. 1 pt. for making 10 passes, 1 pt. for a skater pass and 2 pts. for a goalie pass. 10. Option is to allow passes to players on the blue lines and have them on both sides. This drill is done from diagonal corners. Keep skating and make firm passes. Give a target and call for the pass. Face the puck. Shoot, follow the shot for a rebound and then go out to play a tight gap and defend 1-1 vs. the next shooter. We added one more pass to the previous multiple pass drill. A. 1 exchange passes twice with 2. B. 1 turn out and exchange passes twice with 3. C. 1 skate across and exchange passes two with 4. Attack with speed. Prepare to shoot by squaring up if on the off wing or give a target on the forehand. Shoot quickly with a ‘one timer’ or ‘catch and release.’ Always shoot hard. 1. Players start from the four corners. 2. Player 1 leave from diagonal corners and cut across to the 'Big Ice' between the dots. 3. Player 2 leave from diagonal corners and skate up the ice. 4. Player 1 pass to 2. 5. Player 2 skate to the ‘Big Ice’ and 1 takes the ice behind to the wide lane. 6. Player 2 pass to 1 for a wide entry into the offensive zone. 7. Players 1-2 attack with speed and play ‘Poker’ with the goalie and either pass or shoot. 8. Only one pass in the offensive zone and both players crash the net for a rebound. 9. Alternate leaving from both corners. * This is an unopposed drill that can be enhanced by passing to the previous shooters. * After shooting skate to the blueline and defend 2-1 or 2-2. Topic with description, diagram and video are listed at the link below. Two defensive forwards tag up at the far blue line and then back track through the middle lane and the first F back support low in the defensive zone. Description is for two colours – video has all the D in black. 1. Red on one side in neutral zone and Blue on the other side. 2. Red F1-F2 attack vs. Blue D1-D2. 3. White F1-F2 tag up at the far blue line and backtrack through the middle. 4. F1 backtrack deep and support D1-D2 making it 2 on 3 low in the defensive zone. 5. F2 skate back to the mid high slot. 6. Red D1-D2 follow and support the attack from the blue line. 7. On transition Blue F1-F2 attack Red D1-D2. 8. Red F3-F4 tag up - backtrack and F3 support D1-D2 low. 9. Blue D3-D4 support from the point. The three countries used to be in the Soviet bloc and they share a similar philosophy in how to practice hockey. I have done clinics with Jursinov and coached with him in Salzburg. I coached with Slavamir Lener at the University of Calgary and am meeting Czech skills coach Tomas Pacina in about 90'. The drills that my players are doing are ones I learned from the international coaches I have worked with. The other ones I took videos of while they were practicing. Effective Practice Planning – based on the four game playing roles and three game situations. Offense should attack with speed and force the D to make a decision early by the first play near the blue line. This allows for a second play. D should delay the attack as much as possible and defend the most dangerous player allowing a bad angle shot. D tie up the stick of the most dangerous attacker after the shot, then look for the puck. 1. Red D1 pass to Blue F1. 2. Blue F1 and F2 cross in the neutral zone and attack Red D1 2 on 1. 3. Blue F1 and F2 continue until they score, the goalie freezes the puck or D makes a breakout pass. 4. Red D1 defend and pass to the coach when they get the puck. 5. Coach mirror the play for a pass from the D.
6. The D starting the next rush or a F who just attacked could support and then start the next rush. This is the same drill but the coach allows the players to watch and decide when to start the next 2-1. It starts when the play is over at either end, so players must be alert and engaged. Much more of a player centred approach. The coach can now coach instead of being a traffic cop. C600 – 2-1 x 2 – Player directed. Attack with speed and fight to get the shoulder in front of the defender. Defender get up ice quickly to close the gap and defend from the net side. Attacker use the defender for a screen and move the puck sideways to get a shot through. Defender box out the attacker and control his stick after the shot. All players should take reps at attacking and defending. 1. All the players start from diagonal corners. 2. F1 and D1 x 2 leave. 3. F1 skate to the far face-off dot with the puck and turn back. 4. D1 skate to the top of the circle then backward to the circle bottom then up ice. 5. F1 attack vs. D1 on both sides. 6. F1 and D1 have the option of either turning to the inside or outside. * Improve the drill by passing to the last attacker or the defender carry the puck past the top of the circle. * Engage the players more by eliminating whistles and allow them to see the play is over and start the next rep. Break for a stretch pass after a goal or when the puck is out of play. Transition from offense to defense quickly. 1. Nets are moved up to the top of the circle. 2. Teams line up against the boards in diagonal sides on the new goal line. 3. Players leave on the whistle and play 3-3. 4. When the puck is out of play the non-offending team pass from the line. 5. Change on the whistle with a new puck or better the team in possession pass to the line. *Use modified rules like only 2” with the puck or goals must be on one timer shots. Cut the ice in half and deflect the attacker outside. Angle to the back of the inside shoulder so he can’t turn back. Skate through the hands, stick on puck, inside leg in front. 1. Players line up behind the blue lines on one side of the ice. 2. Coach shoot the puck across the ice just inside the blue line. 3. Player one skate for the puck and the second player tag up at the red line. 4. Player one skate with the puck to the far end and the second player angle. 5. Player two angle check player one and take the puck. 7. The other line repeat the opposite way with players 3 and 4. * Improve the drill and allow the defender to try to score on the other net and original attacker chases. Everytime I add a drill it is added to the section where it belongs. Forwards face the puck and give a target. D be in the triple threat position and don’t ‘dust the puck off’. F attack with speed, make first play early, one high one low-one fast one slow. D and goalie work together. D prevent the puck from crossing the mid line and take the dangerous stick after the shot. 1. Blue F and Red D across from each other, Blue F and Blue D at other blue line. 2. Red and Blue D1 start at each blue line in the middle. 3. Blue F1 and leave with a puck. 4. Blue F1 pass to Red D1 who exchanges ‘one touch’ passes to F1-F2. 5. Red D1 ‘one touch’ up ice to Blue D1. 6. Blue F1-F2 skate to the wide lanes then cross in front of Blue D1. 7. Blue D1 skate to open ice and ‘one touch’ to F1 or F2. 8. Blue F1-F2 attack 2-1 vs. Red D1 and finish the attack. 9. Repeat the other way with Red F1-F2 regroup with Blue D1. Practice at game speed. Give a target and be ready to shoot. Do from both sides. 3. F2 pass off the pads and F1drive skate for rebound. 4. F1 skate behind and pick up a pass from a coach. 5. F2 mirror F1 movement from mid-slot. Attackers skate and protect the puck setting screens and picks. Defenders play man on man from the net side, talk and switch if needed. 1. Attackers 1-2-3 have pucks in various areas of the attacking zone. 2. Defenders 1-2-3 pair up and wait from the defensive side. 3. Pairs are numbered 1-2-3. 4. Pair 1 start A1 attacking vs. D1. 5. Pair 2 start in about 10” joined by Pair 1 and play 2-2. 6. Next whistle Pair 3 start and play 3 on 3. * Make it competitive and keep score. Defenseman play a tight gap and keep the attacker to the outside. Forward come back hard and force the attacker into the D without taking a stick penalty. 1. D start in the middle circle and forwards start in the corner. 2. Red backpressure on one side and blue on the other. 3. F1R attack from hash vs. D1B and F1B backpressure from goal line. 4. Defense play a tight gap so attacker F1R chips it in. 5. Forward back pressuring F1R picks up the chip. 6. F1R passes to F2B waiting at the hash. 7. F2B attacks vs. D2R and F2R back pressures. 8. If back pressuring forward causes a turn-over than the D pic up the loose puck. Teams take turns having the man advantage. Players must read the situation and adjust. 1. Start with 1-1 and the extra players are on the bench. 2. You can play situations up to ¼ of your total amount of players. i.e. to get to 5-5 you need a total of 20 players. 4-4 needs 16 players, 3-3 at least 12. 3. One team gets the advantage first. In the diagram the Red gets the advantage first. 4. Change on the go about 30” shifts and pass to teammate coming on or back to the goalie. 5. Part One: Red, 1-1, 2-1, 2-2, 3-2, 3-3, 4-3, 4-4, 5-4, 5-5. 6. Part Two: Blue, 1-1, 2-1, 2-2, 3-2, 3-3, 4-3, 4-4, 5-4, 5-5. * Option is to dump the puck in instead of regroup and breakout D-D-F.
Come back hard all the way to the low slot. 1. Blue shoot on one net and red on the other. 2. Red 1 pass to Blue 1. 3. Blue 1-2 attack as fast as possible and shoot on the far net. 4. Red 1-2 come back hard to the top of the crease. 5. After the shot Red 1-2 box out and prevent a second shot. 6. Blue 1-2 start from behind the net. 7. Blue 1 or 2 pass to Red 3 or 4. 8. Red 3-4 attack with speed and Blue 1-2 backtrack hard to the top of the crease. Use obstacles to do various agility skating and puck handling exercises. Use all the edges and pivot in many directions. There are many more exercises and some attachments to create more tasks. 1. Set up 4 obstacles on each side. 2. Players leave from diagonal corners and do a series of exercises, finish with a shot. 3. Legs wide apart, hands close together, slide the puck under alternate sides. 4. Puck under on one side and Crosby slide around the end, alternate sides. 5. First slide under one side, step over other side, second Crosby with a push all the way around, slide puck under on each side. 6. Puck on one side, slide under and hope over three times. Alternate ends. 7. Skate forward around top, backward and slide through, jump over, under and over other way, pivot with the puck and forward to next obstacle.